Veterans Day in my classroom is about far more than honoring our veterans. 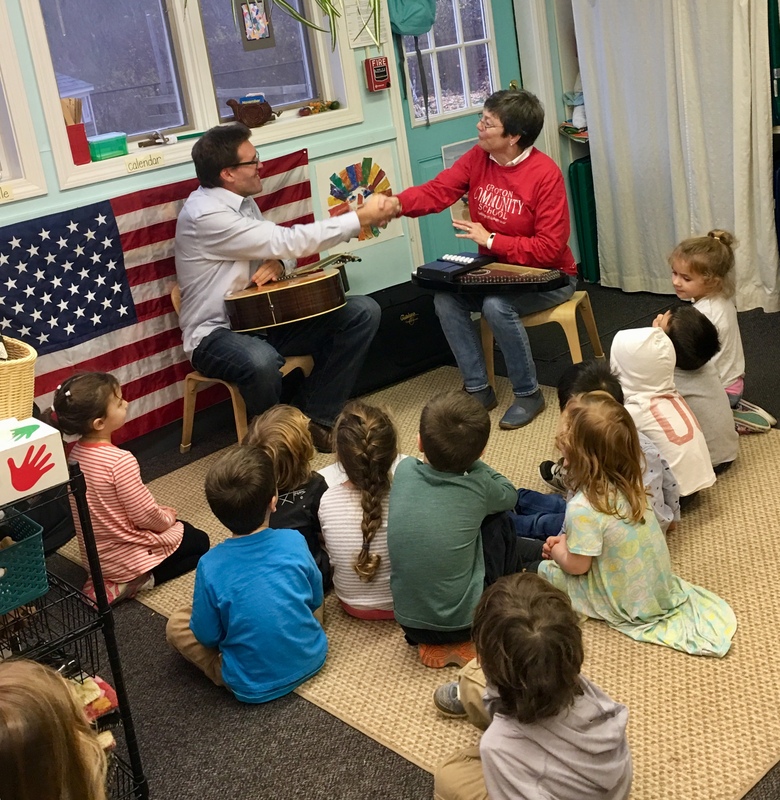 For preschoolers it is an introduction to the American flag and our country. It is history, geography, and patriotic songs. What started out as a day to embrace these activities became far more than anticipated. We began by hanging the flag and using a big map of the United States at Morning Meeting. There was much to talk about- where we live (Massachusetts is small), north south east and west, oceans and mountains. With the American flag hanging behind us, children could better understand that 50 states = 50 stars. I asked children, “If you see someone in a military uniform this weekend, what should you do?” A few children knew that “Say thank you” is the right thing to do. Then I said, “You can also shake their hand, like this.” I shook every child’s hand. Learning how to shake hands is important! We moved the big map to a table and added our ‘travel box’, filled with maps, postcards, real money, and magnifying glasses. 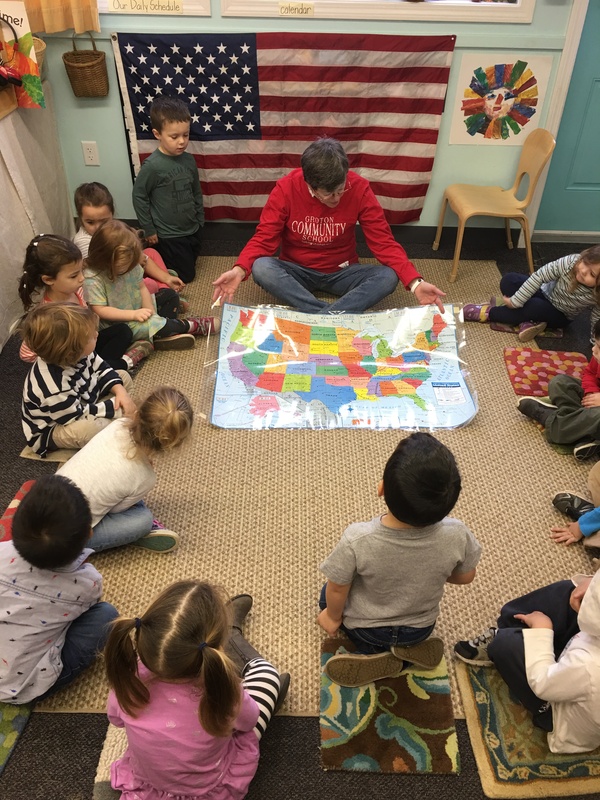 While children were eager to crowd around and ‘travel’ across America, a few children took it upon themselves to move all the classroom chairs over to the big rug, line them up, and pretend it was a plane. They brought along their maps and began to travel. 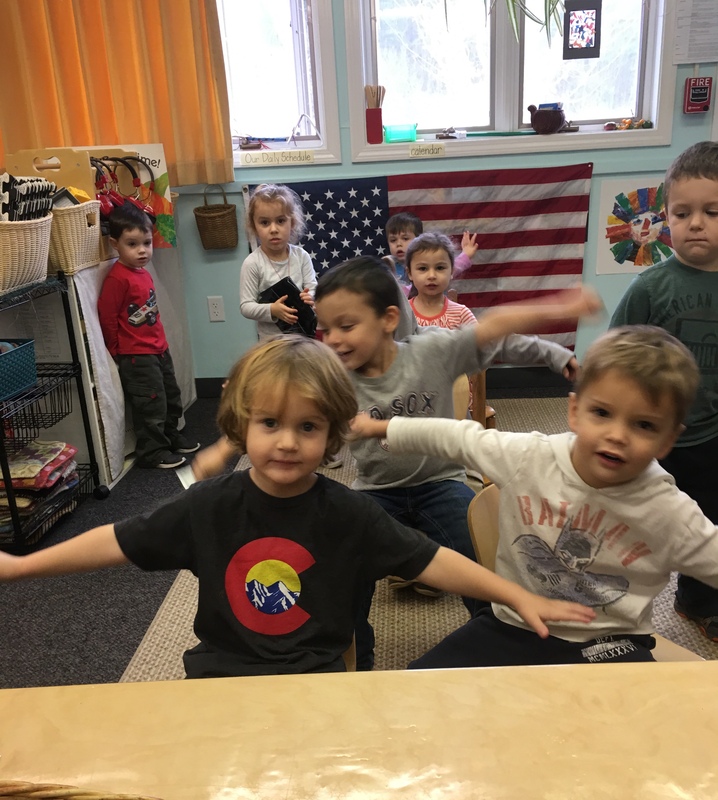 This is the heart of learning, where children grab onto what is happening, embrace a concept or activity, and take it upon themselves to do more. It’s called Emergent Curriculum. Children guide what happens next. That’s the learning that ‘sticks’. We played patriotic songs in the background. 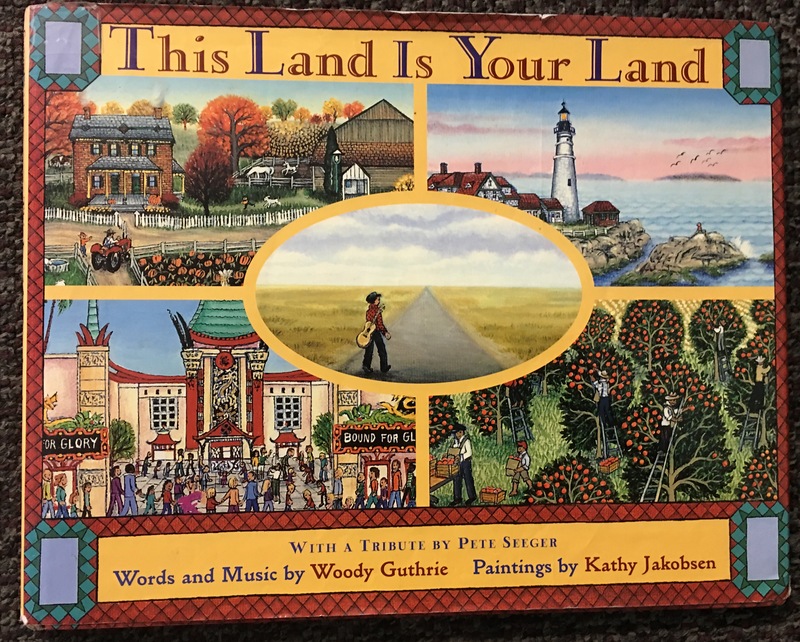 Emmett begged to hear the song “This Land is Your Land” and also look at the book. Between using the big map, flying on a plane in the chairs, and singing, it was a full morning. We still had time to do painting as well. In the afternoon, we had a guest and his guitar visit us. It is always very cool to see and hear a real instrument. Travis wanted to play and sing two patriotic songs. First he tuned his guitar (you could have heard a pin drop) with 15 wide-eyed children watching. He sang “My Country ‘Tis of Thee”, with a fabulous voice and a great guitar ending. It was wonderful. Then he wanted to sing, “This Land is Your Land.” Emmett was thrilled, as were most of the children- we sing it often, all six verses. To my good luck, Travis plays the song in the key of D, and so do I. We were then able to play the chorus and sing together. Thank you, Travis! And another opportunity for children to see a handshake. 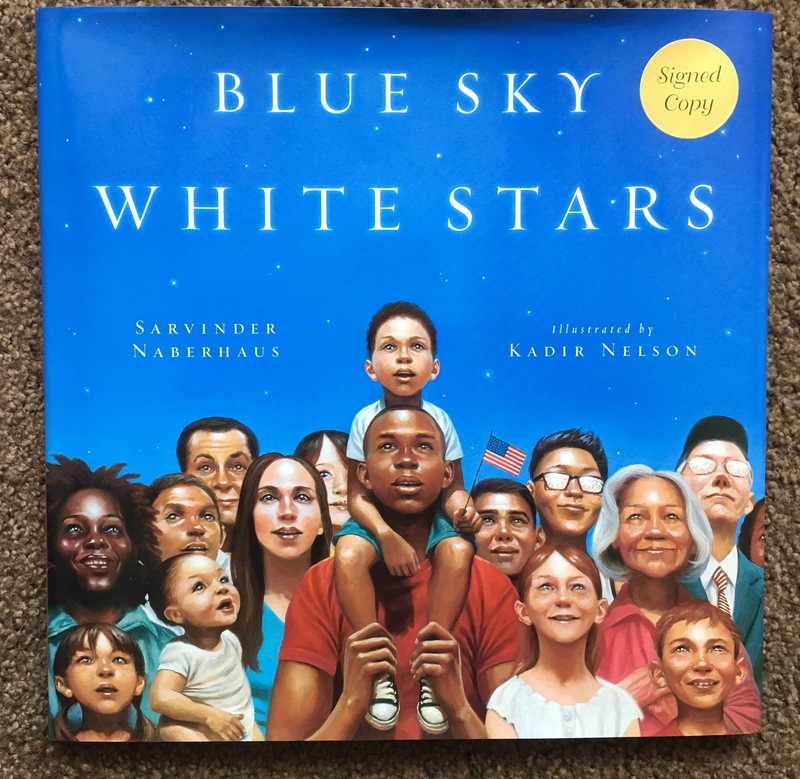 We finished the day reading a book about America, Blue Sky, White Stars by Sarvinder Naberhaus. Simple text, gorgeous illustrations. For example, red rows depicting rows of trees in red foliage and also red rows on the flag. I highly recommend this book. I’m picky, and don’t buy many books. This was a ‘must have’ for me. It was a very good day for children. This entry was posted in American flag, children's books, geography, Giving thanks, military, picture books, Singing, young children and tagged America, American flag, Blue Sky White Stars, My Country 'Tis of Thee, Teaching patriotism, This Land is Your Land, Veterans' Day. Bookmark the permalink. Jennie, this is so wonderful. The kids are so focused on you two. I remember from past posts how much they loved that song. You’re pos-i-lutely brilliant as a teacher. Mega hugs. This is so outstanding! We need a Jennie Day for all you do!! You are most welcome, and I am deeply appreciative of your comments. These are such very important things to teach children. Great job, Jennie! I think that is marvelous. Any little thing you can do makes an impact. Did the children make paper poppies? Had I really been on top of things (always feel behind) I would have invited a member of the military to visit the children. Even so, the day turned out well. Oh we are constantly travelling… By bus, plane, car or rocket! It depends on what they feel like at the time!! How wonderful! I agree it is so important for children to learn how to shake hands. My dad taught us to shake hands by the time we were three and I’ve always been thankful for that. I remember being in kindergarten and having to shake my teacher’s hand goodbye before getting into my mother’s car to go home. It was a ritual, and like you I am so glad. Thank you, Darlene. what a lovely lesson and just right for the youngest. Excellent, Jennie. You must be exhausted by day’s end. Tell the one boy that I like his Red Sox shirt. By the way, i talked about Nathan Hale as best I could the other day. Some were a bit shocked when they learned he was hanged. One 7th grader commented that it was a rather somber story to which I noted that history has many somber stories. Yes, I’m exhausted at the end of the day. Happy tired. 🙂 So glad you enjoyed this!! And I absolutely LOVE the Nathan Hale story!!! I have yet to write down your stories this year. I’m grabbing a pen- what a great first one. Please keep them coming. Really. Best to you, Steve. I’ll get my story written sooner than later, I hope, Jennie. It’ll give you proper fodder for a posting. Fabulous to hear Woody being played so gustily! I knew you would love this, Opher! Poor Travis didn’t know there were six verses (few people do), but he was a quick learner. I never had a school day like that one. In just one day, you crammed in so many new experiences, as well as reflecting on the remembrance day, and education about your country too. They are lucky to have you, Jennie, and I am sure they know that. I so loved reading this and watching the videos. Squirmy kids soaking up information as they wriggle and wiggle. 🙂 Warms the heart and makes it sing. 😉 I never forget Veterans day. What a great lesson, Jennie. I think it’s so good that you’re starting them off with an understanding of what this day means. Thank you, Dan. I feel I make a mark, or leave children with something that sticks, when I do this. It’s important. I’m sure you do, and the kids that come back must underscore that. You may never know how important a mark you leave. I think you’re right on that, Dan. I may never know, but that’s okay. What a wonderful day, Jennie. The children learn so much in your emergent curriculum. Jennie, you are showing us a perfect example of how our children should be taught. Thank you so much, Dayne! I think I have said this before, Jennie, but I think the patriotism in the US is wonderful. It is fantastic that your children have respect and regard for their country and the people who help defend it. Beautiful! That book cover is a great example of patriotism! Thank you! Thank you, Robert! Like you, I love art. Some of the best art can be found in children’s book illustrators. The cover (and the book) was painted by Kadir Nelson. I’m the children’s book guru, so I get to see some incredible art. And yes, that cover is a great example of patriotism. Wonderful, Jennie! I remember learning about patriotism as a young child, and singing the same songs. 😊 I enjoyed the videos and the children’s exuberance! When we learn about patriotism as children, it really sticks. I have the same childhood memories. I’m so glad you enjoyed this. Thank you, Marie.